Attached is a Division Memorandum from Rhea Mar Angtud, Ed.D., CESO VI, Schools Division Superintendent, Division of Cebu Province dated June 21, 2017, entitled “PERMISSION/PERMIT TO STUDY” which is self-explanatory, for the information, guidance, and compliance of all concerned. This Office hereby informs the field that the PERMIT TO STUDY sought by any teacher or nonteaching staffs must be properly endorsed by the Public Schools District Supervisor (PSDS) or the head of office concerned in case of non-teaching personnel from the Division Office. The application or letter-request must be accompanied by the draft filled-up enrollment form in that particular semester or summer term duly signed by the Registrar or Dean of the College/University. Teachers who will enroll or study to any graduate or post-graduate studies should carry only nine (9) units during the regular semester, however, they can carry the full study load of nine (9) units during Summer term (having no teaching duties during Summer). Schools heads and nonteaching staffs must also carry or enroll nine (9) units only during the regular semester and six (6) units only during the Summer term. Teachers and nonteaching staffs who intend to carry the full study load of 12 units in a regular semester and nine (9) units in a Summer term may only be allowed if they are graduating or about to take the Comprehensive Examination on a case-to-case basis. Nonteaching staffs/second coursers who intend to enroll the full 18-unit requirement or undergraduate courses/subjects for them to take the Licensure Examination for Teachers (LET) can carry the full/regular study load in a given semester provided that they have a Very Satisfactory (VS) or an Outstanding (O) performance in the immediately preceding rating period. Part-time Study shall only be pursued during Saturdays and Sundays or starting 6:00PM during weekdays (Mondays-Fridays). The Permit to Study to pursue or enroll masteral/doctoral studies to any college or higher education institutions shall be given for a period of two school years provided that such schooling will not affect the performance of the regular/permanent teacher or employee concerned. A Very Satisfactory Performance is needed during the time that the teacher/employee is on part-time study. If in the event, he/she will be rated Satisfactory or Unsatisfactory/Poor Performance during the first year of the study, the PERMIT is automatically considered revoked. A brief Report of Accomplishment and the presentation of the diploma are needed upon completion of the degree/course pursued. PSDSs and heads of sections/units must also monitor the grades versus the office performance/s of their staffs every semester or year while they are on part-time study. Teachers and non-teaching staffs are also hereby advised that as much as possible, their enrollment to any graduate or post-graduate studies must be VERTICALLY ARTICULATED and ALIGNED to their baccalaureate degrees or fields of specializations. For example, if the teacher obtained BSED-Mathematics in his/her undergraduate degree, s/he should pursue MS/MA-Math or doctoral degree in Mathematics. Permit to Study for teachers and non-teaching staffs who are pursuing other courses/degrees not mentioned above such as online/distance learning, JD or an LLB degree, open university and other educational delivery modes provided by higher education institutions here and abroad will be evaluated on a case-to-case bases or based on the special circumstance/s governing each degree or course. 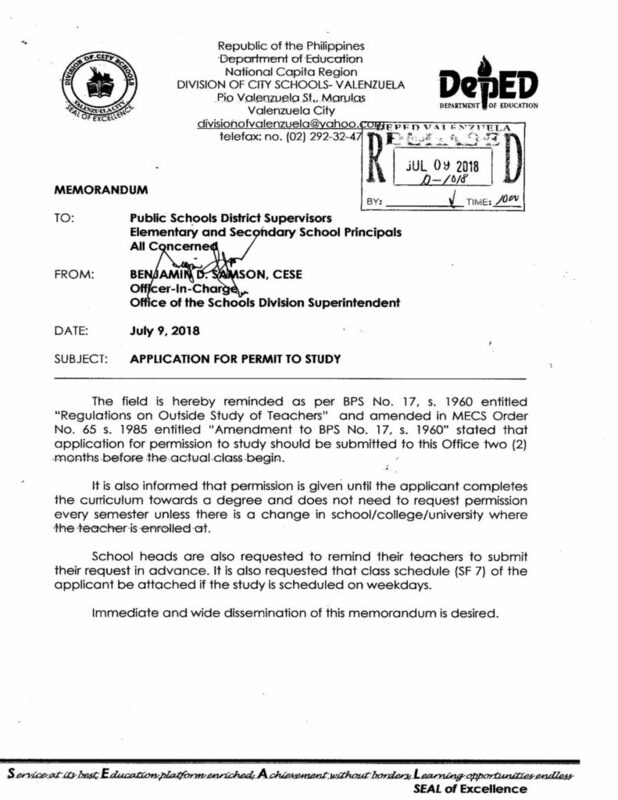 Attached is a Division Memorandum from Benjamin D. Samson, CESE, OIC-Schools Division Superintendent, Division of City Schools – Valenzuela dated July 9, 2018, entitled “APPROVAL OF PERMIT TO STUDY” which is self-explanatory, for the information, guidance, and compliance of all concerned. The field is hereby reminded as per BPS No. 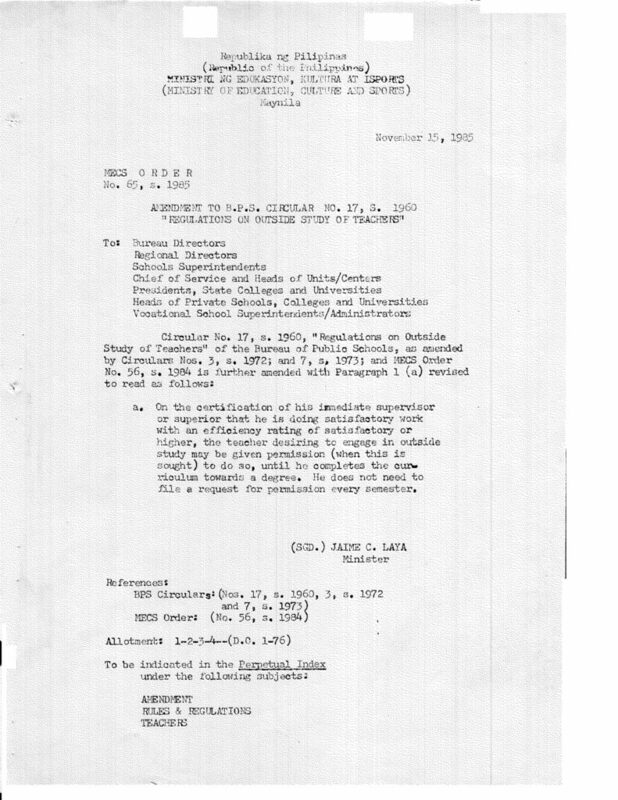 17, s. 1960 entitled “Regulations on Outside Study of Teachers” and amended in MECS Order No. 65 s. 1985 entitled “Amendment to BPS No. 17, s. 1960” stated that application for permission to study should be submitted to this Office two (2) months before -the actual-class-begin. It is also informed that permission is given until the applicant completes the curriculum towards a degree and does not need to request permission every semester unless there is a change in school/college/university where •the teacher is enrolled at. School heads are also requested to remind their teachers to submit their request in advance. It is also requested that class schedule (SF 7) of the applicant be attached if the study is scheduled on weekdays. 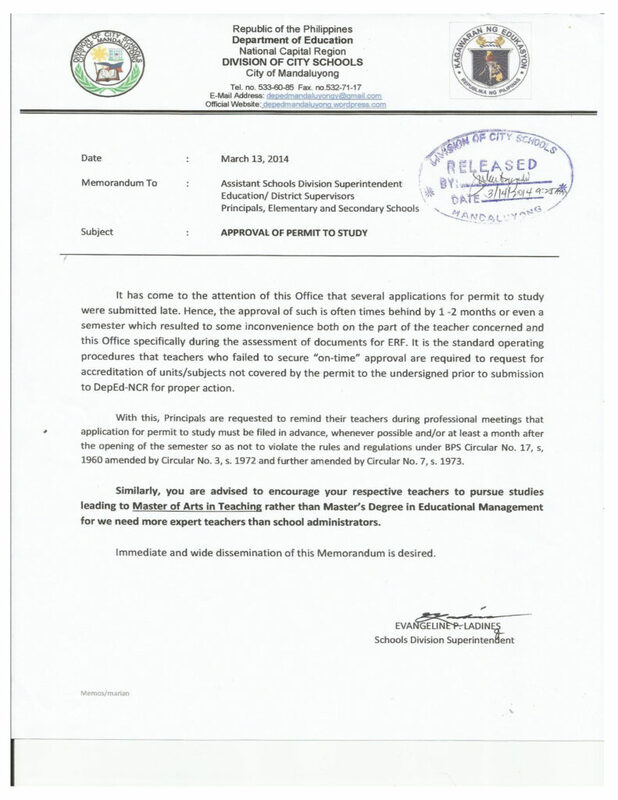 Attached is a Division Memorandum from Evangeline P. Ladines, Schools Division Superintendent, Division of Mandaluyong dated March 14, 2914, entitled “APPROVAL OF PERMIT TO STUDY” which is self-explanatory, for the information, guidance, and compliance of all concerned. It has come to the attention of this Office that several applications for permit to study were submitted late. Hence, the approval of such is often times behind by 1 -2 months or even a semester which resulted to some inconvenience both on the part of the teacher concerned and this Office specifically during the assessment of documents for ERF. It is the standard operating procedures that teachers who failed to secure “on-time” approval are required to request for accreditation of units/subjects not covered by the permit to the undersigned prior to submission to DepEd-NCR for proper action. 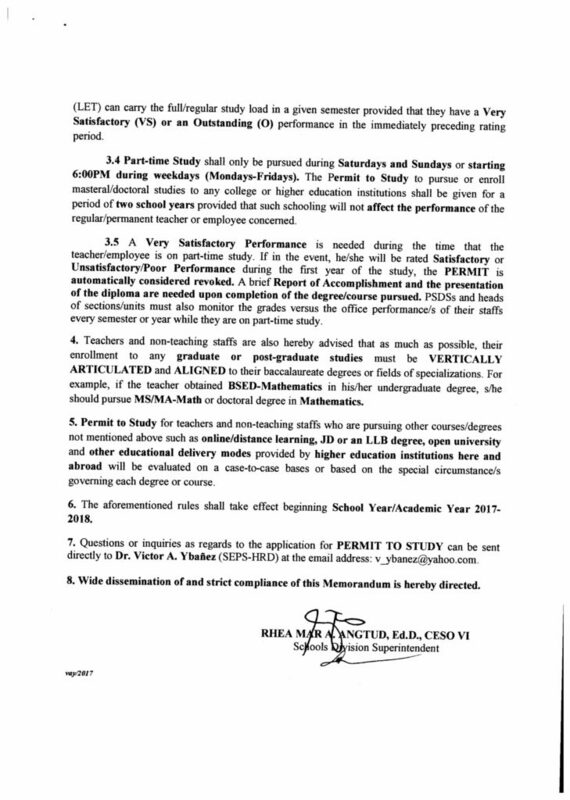 With this, Principals are requested to remind their teachers during professional meetings that application for permit to study must be filed in advance, whenever possible and/or at least a month after the opening of the semester so as not to violate the rules and regulations under BPS Circular No. 17, s, 1960 amended by Circular No. 3, s. 1972 and further amended by Circular No. 7, s. 1973. Similarly, you are advised to encourage your respective teachers to pursue studies leading to Master of Arts in Teaching rather than Master’s Degree in Educational Management for we need more expert teachers than school administrators. 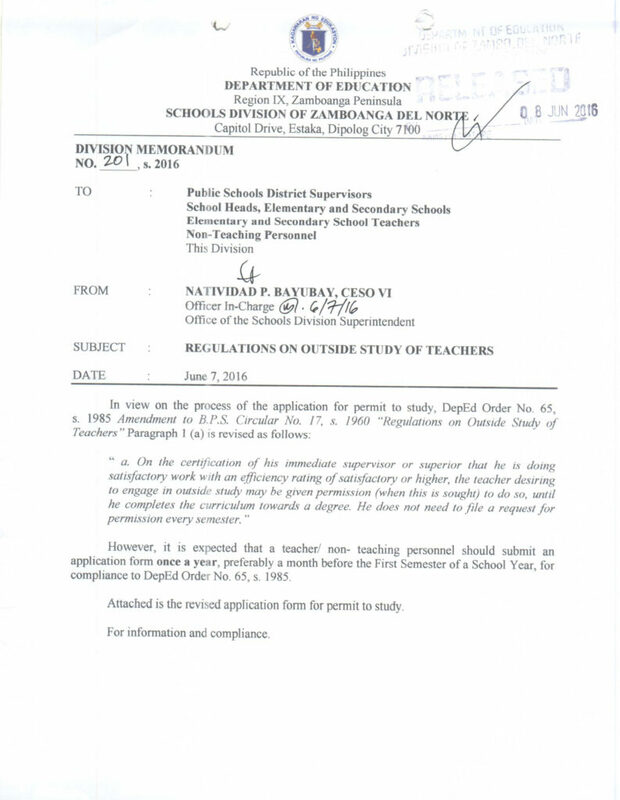 Attached is a Division Memorandum from Natividad P. Bayubay, CESO IV, OIC-Schools Division Superintendent, Schools Division of Zamboanga del Norte dated July 7, 2016, entitled “REGULATIONS ON OUTSIDE STUDY OF TEACHERS” which is self-explanatory, for the information, guidance, and compliance of all concerned. However, it is expected that a teacher/ non- teaching personnel should submit an application form once a year, preferably a month before the First Semester of a School Year, for compliance to DepEd Order No. 65, s. 1985.